NAS Meridian is approximately 15 miles northeast of the city of Meridian. Meridian is a very military-friendly town, and the local community has rallied around NAS Meridian through several rounds of BRAC, to prevent the base from being moved or shut down. The military leadership maintains a healthy relationship with local community leaders, and organizations. 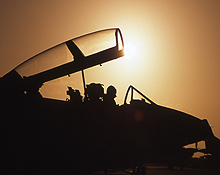 NAS Meridian exists to train the warfighter. It accomplishes its mission of enabling warfighter readiness by providing timely, quality services and facilities in an environmentally safe, secure community.